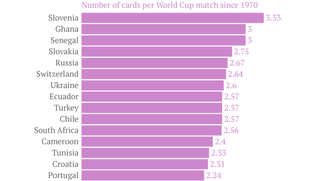 Which Countries Get Carded The Most At The World Cup? Quartz has crunched the numbers on World Cup penalties, counting all the yellow and red cards for every squad back to 1970. Slovenia comes in number one, racking up 20 cards in their six World Cup games (3.33 per game). Peru was the least penalized, with nine cards in 13 games (0.69 per game). There hasn't been a lot of success among the heavily penalized. As Quartz points out, none of the top 20 teams in cards per game have made it to a World Cup final. You can check out the full rankings over on Quartz.